Many listening aids and books have been developed for promoting old time fiddle music; specifically in teaching fiddlers how to play fiddle and in preserving many collections of fiddle tunes. However, few aids exist to help accompanists develop their skills in accompanying fiddlers. Through research and travels with performing and teaching, there have been continual requests for a graded approach to help fiddle accompanists develop and apply music theory, practice, instrumental and performance skills. To meet this need, two teaching series to assist fiddlers and fiddle accompanists in this learning process have been developed. The names of these projects are The Joys of Fiddle Music - Volumes 1 and 2, and The Fiddle Accompanist's Chord Chart Collection - Volumes 1 and 2. My aim, with these learning resources, is to help the accompanist become acquainted with the basic flow of fiddle music, develop instrumental, technical and performance skills in accompanying, and provide a starting point in learning fiddle tunes played in contests, jam sessions, dances, and shows throughout North America. If you are starting as an accompanist on piano, guitar, or any other chording instrument, or wish to start developing an ear for this music, these series are for you. Both of these resources can either be used in a self help manner or in private music lessons with your teacher. The first book and recording, The Joys of Fiddle Music -Volume #1 contains tunes with no more than two chord changes, and is in the four basic major fiddle keys (C, G, D, A) and the two basic minor chords (A minor and E minor). The second book and recording, The Joys of Fiddle Music - Volume #2, contains tunes in the four basic major fiddle keys (C, G, D, A) along with three common minor fiddle keys (Am, Em, Gm). In both books, performance practices in fiddle music, music theory explanations, guides for chord inversions, guides for playing scales and notated arrangements of fiddle tunes are printed. An accompanying tape/CD contains all tunes in the book recorded at both dance tempo and practice tempo. The fiddle track is found on the right speaker and the accompaniment track on the left speaker. 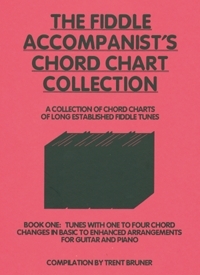 For The Fiddle Accompanist's Chord Chart Collection, the musical concepts can be applied to any chording instrument, including guitar and piano. The fiddle melodies are recorded on the accompanying tapes/CDs, encouraging the accompanist in listening to the recordings to learn these melodies by ear. The written chord arrangements (from basic to enhanced) show the accompanist how accompaniment arrangements can be built. Because of audio format, the tunes on this recording are done at dance tempo only. Examine how each arrangement is built from basic to advanced levels. Discover how these arrangements relate to different accompaniment styles in fiddle music. Understand how music theory is applied in practice by the top accompanists in these tunes. The accompanying tapes/CDs contain all tunes for each book at dance tempo, with the fiddle track found on the left speaker and the accompaniment track found on the right speaker. I trust that these learning aids will assist you in developing your music skills and give you a better appreciation of an art form that is making a comeback. May these learning packages bring you many hours of musical enjoyment! "This series of Book and CD sets is designed to aid the beginning fiddle player accompanist in their development on Guitar and / or piano, as well as give the fiddler a practice tool if they have no access to regular accompaniment in their local area." Assisted by Jeanne Buckley (Fiddle), Cammy Romanuck (Fiddle), Fred Buckley (Guitar) and Lucas Welsh (Guitar). "This collection of chord charts and accompanying recording is from requests of fiddle and accompanying students at various fiddle camps throughout Canada and the United States who desire to be more comfortable in accompanying long established fiddle tunes, whether they be traditional in origin or composed by fiddlers of yesterday." Assisted by Calvin Vollrath (Fiddle).